Running backs who can catch the ball are crucial for fantasy success. We mentioned Alabama running back T.J. Yeldon earlier last week as a potential underrated pass catcher. We also mentioned Miami prospect Duke Johnson as one of the more natural receivers in this year's draft. Johnson also possesses the gift of elusiveness shared by pros like LeSean McCoy and Jamaal Charles. Yeldon, on the other hand, is more of a steady running back who prefers to move the chains rather than break tackles and rattle off huge gains. Both styles have their pros and cons. For example, Yeldon might not make the biggest splash in the points category from week to week, but he looks like a steady, serviceable back that can move the chains and hover around 80-100 rushing yards mark and toss in the occasional 30-35 receiving yards. This is all depending on whether or not he gets drafted to a team that wants to utilize him in that way of course. When it comes to Johnson's weakness, his undersized frame may lend itself to the occasional zero-point performance because bigger, more physical defenses will be able to stuff him at the line of scrimmage. We saw that happen a lot with LeSean McCoy in 2014, and it led to the Eagles running back being one of the most talked about trade options in fantasy leagues throughout the year. But what if you don't want to risk any of those things from either Yeldon or Johnson happening? Well, there's one prospect who possesses the rare combination of size, speed and catching ability that few running backs in this draft have. That guy is Boise State prospect Jay Ajayi. Standing 6'0 and weighing 221lbs, Ajayi thrived under a pass-heavy offensive scheme and it led to him being one of the most prolific running backs in college last season. As a redshirt junior in 2014, Ajayi logged 535 receiving yards on 50 catches to go along with four receiving touchdowns. Unlike the run-first offense Yeldon was in while at Alabama, Ajayi benefited from playing in an offense that passed the ball 415 times, which ranked 35th overall in the nation. Ajayi ranked fifth in nation in rushing yards with 1,823 (5.3 yards per attempt) but also logged 347 carries, the most in the nation. Ajayi ranked 17th overall in rushing attempts the previous year, so his durability is something you should consider if you plan on investing in him long-term. Am I saying to avoid him as a draft pick because he carried the ball a lot in college? Absolutely not. It all depends on what your situation is. For example, if your team is one good running back away from winning a championship, Ajayi has to be in the conversation as your first-round pick depending on where he ends up in the NFL. With his ability to make big plays both in the run and pass game, there's not a lot of weaknesses in his game from a fantasy perspective. In terms of being an instant impact guy, he's one of the most NFL ready running backs there is. He does come with some weaknesses as a football player though when you factor in his suspect pass blocking. He also tries to move laterally rather than north and south from time to time as well, but those issues shouldn't detract from his fantasy value too much. A fighter who looks to initiate contact rather than avoid it, Ajayi actually evokes a style similar to Seahawks running back Marshawn Lynch. I know it's a little crazy to compare him to Lynch given how incredible Lynch has been at breaking tackles at the pro level, but Ajayi runs with the same kind of purpose that allows guys like Lynch to be so tough to bring down. Ajayi rarely shies away from defenders, and almost uses momentum from their hits to transfer into his next move. Ajayi is also a homerun hitter, as he scored touchdowns of 70+ yards in both rushing and receiving in 2014. If you're drafting Ajayi in your dynasty league, you're looking for the occasional 30-35 fantasy point performance. Here we have Ajayi catching a screen pass against Ole Miss in Boise State's first game of 2014. Notice how he doesn't get bumped off course by the Ole Miss defensive linemen when he slips out into the flat, a testament to his size and low center of gravity which will make him hard to bring down at the next level. He finished with a season-high 12 catches in this game, against a defense that ended up in the Top 15 overall in 2014. Here is a good example of Ajayi's relentless ability to stay upright. In total on this play, he breaks about four tackles, spinning and twisting his way from the 27-yard line almost to the 35. While it's impressive, you always have to wonder how this running style will translate to the next level. Often times, a running back will try too much to gain the extra yard and wind up taking a big hit or worse, fumble the football. Ajayi fumbled 11 times over his last 597 carries, which often stemmed from him trying to fight through defenders. Here we see how Ajayi's tough running style can be problematic. He shakes one defender, but then tries to bounce the ball to the outside without fully securing the ball with the other hand after making the first guy miss. It's not like his fumbling problems are a huge detractor from his overall game, it's just something that you may encounter if you draft him because he runs so hard. There's an embarrassment of riches this season when it comes to taking a dynasty running back in fantasy leagues. 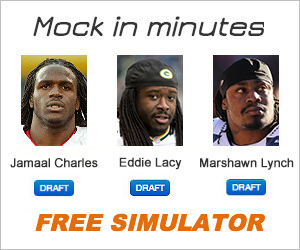 Because of this, it can be tough to know which running back to go with. Obviously, the situation will play a huge role, but Ajayi is the one running back that might not need as much help from his offense to be successful. He can make guys miss on his own so he can help out his offensive line when they miss blocks. He also runs physically hard, which can help him fall forward and avoid big tackles for a loss.